The men’s golf team wrapped up its fall season Friday at the Clarke Fall Invitational in Galena, IL. The Duhawks finished strong with a second-place team finish, adding another tremendous feat to their fall resume. This second-place finish comes on the heels of a first-place victory at the Elmhurst Invitational just one-week prior. Viterbo University took home the hardwood following the meet, shooting a team combined 306 and finishing just five strokes in front of Loras. Among other finishers were American Rivers Conference foe the University of Dubuque, who placed fourth, Southwest Tech placing sixth, and host Clarke University placing ninth. Among individual performers, junior Jake Grabner led the way for the Duhawks once again. He shot a team best 5-over 77 and finished tied eighth overall. 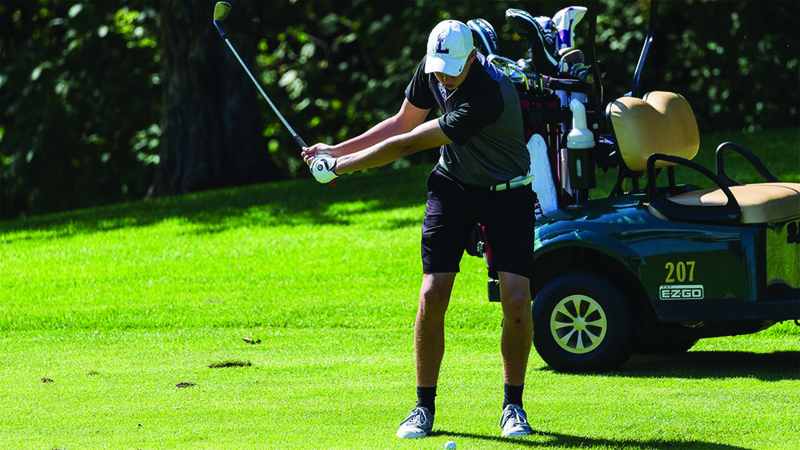 Among other top finishers for Loras included sophomore Jake Peiser, first-year Ryan Keating, and junior Peter Hutton, all finishing tied 12th carding a 6-over 78. Matt Zimmerman of Viterbo University captured the individual victory, shooting an impressive 2-over 74. Zimmerman’s play definitely set the pace for Viterbo, who took the lead and never looked back. The fall season for men’s golf has now come to a close, but there was no shortage of positive outcomes that came of this campaign. Junior Jake Grabner chips at the ball with one of his irons. The iron clubs are more mid-distance allowing you to keep the same swing with a different expectation in distance. Following a postponement of The Clarke Invitational, which was supposed to be the Duhawks opening match, Loras had to open the season instead at the Midwest Regional Invitational the following week. The Duhawks showed some bright spots in tournament play, however, ultimately finished middle of the pack, placing 14th of 32 teams. 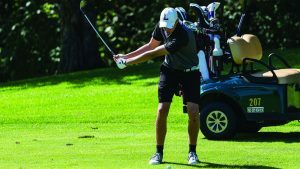 Building on the positives of match play, Loras returned home to host the Loras Fall Invitational, a tournament in which they placed second. They continued to keep the momentum rolling that same week, heading to Oakbrook, IL, and taking home the team title at the Elmhurst Invitational. A fourth-place finish at the MSOE (Milwaukee School of Engineering) Invitational as well as another second place finish, courtesy of great individual play at the Clarke Invitational, made for a strong fall campaign for the Duhawks. Head coach Gabe Miller said the he is most pleased with the overall development of the team, saying improvement always is gratifying to see.